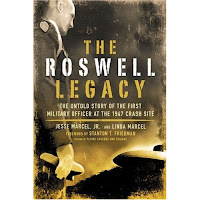 Still to this day the testimony of Major Jesse Marcel (the first person to see the wreckage of the alleged roswell crash) is highly important. 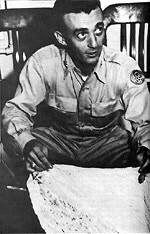 Marcel was the head atomic intelligence officer for the base. His final interview testimony that the weather ballon story was a lie was highly important. The government hopes that with time and the passing of most of the witnesses of the incident that this story remains forgotten for good. However the legend of Roswell and the deathbed testimonials of threats from the military from family members and staff that worked on the incident still remind us that Roswell was indeed the recovery of a craft not from this world. This event must not be forgotten and should be studied by future generations to come. The first atomic nuclear test, the Trinity test occured on US soil in 1945 whitesands New mexico. The Roswell incident occured in July 1947. Ufologists believed that the first 'flying disks' sightings occurred in the late 40's, and have risen ever since then - so was it ET monitoring of our involvement in nuclear testing that lead to the incident? Also was it no coincidence that months after the incident that the CIA was formed, in September 18, 1947? With the help of the CIA, if the government has been able to keep the Roswell incident a secret for almost 65 years then the question arises what else have they kept from us?. From the late 90's and onwards new witness testimonials have come forward from many elderly people who were either at the incident or had family memebers that were involved were someway. Common amoung the testimonials was the severity of the threats from the military about keeping what happened confidential, including death threats. I highly encourage﻿ everyone to read Jesse's book, ROSWELL LEGACY. It's very interesting. . He provides documented proof of his dad's military education, including Rawin radar targets. One of the most infuriating aspects of human nature is the tendency of my fellow humans to exchange good evidence for bad. Jesse Marcel was not a reliable witness. The Roswell incident is most certainly bunk. For one thing, has anyone wondered why Marcel would blab about finding a "disk" but why the aliens that were supposedly at the supposed crash site didn't also make the news wires? If I hadn't seen a UFO myself (a foo fighter-like object that appeared to be dodging a much much larger plane) I'd have a hard time believing there's anything to it. "true" story!? never made it to the News wires? and this NEVER happened, the way YOU, know it did,...you'd keep your mouth closed,"wouldn't you??" And this is the problem!...but the people of Roswell...know better!? My point is and remains that if you're going to blab about finding a craft from outer space, there's nothing whatever to stop you from also mentioning alien bodies if there actually were any. Charles B. Moore is on record as saying that the Roswell business is the bunk and also that UFOs are both real and a type of craft. Unlike Marcel, he was, in 1947, one of the foremost experts on what was supposed to be up there and has not been caught lavishly exaggerating his pre-Roswell experience. I saw an alien today, he was cutting my neighbors grass about an hour ago.